Are you in to Valentine’s Day? Do you love the expensive roses, the sappy cards, and the calorific chocolates? I’m afraid I’m not. It’s not that I don’t like the idea of romance, and sweet gifts, and babysitters for the kids so the hubster and I can get some alone time. I’m just not keen on, in fact really put off by, the whole Hallmark Holiday aspect of it all. Scheduling romance for February 14th because Godiva wants to sell more bon bons just isn’t my thing, ya know? As it turned out, February 14th happens to be our youngest’s birthday so VDay tends to be more about him than romantic notions in our house. Works out perfectly. But I have to tell you that it was quite refreshing to come across a like-minded somebody in Erica @ Northwest Edible Life. I’ve been following her blog for a while now and I just love the no-nonsense approach she takes to raising her kids and running her home, growing her veges and raising her chickens, canning and DIYing, and all things I love to do, too. If I’m honest I’d tell you she is something of a bloggy-crush for me… but perhaps I am oversharing (!!). I do think she is pretty awesome though AND it turns out that she’s not so keen on Valentine’s Day either! I’m telling you, we are kindred spirits. Anyway, Erica wrote a funny post today describing her disasterous first Valentine’s Day date with her then-boyfriend, now husband, and how as a result they tend to stay in on Vday. I’m sure I could have written that post myself. But to follow up she offered the most fabulous sounding Anti-Valentine’s Day remedy that I just had to repost. 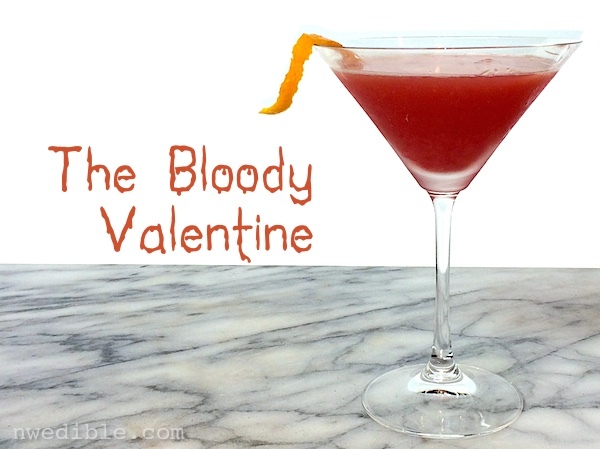 She calls it: The Bloody Valentine. Sounds divine, right? And blood oranges happen to be one of my favourite fruits of all time. Erica describes it as “..charmingly macabre” and “…all exotic citrus and smokey whiskey”. I mean, it has got to be good, don’t you think? So who’s with me? Wanna take a stand against the VDay madness and enjoy a few Bloody Valentines with me this weekend? I absolutely agree. Everyday should be Valentine’s Day!